As an addendum to my article, "Antique gramophone lovers beware of crap-o-phones and franken-phones", the antique dealer who sold us the machine was shocked to find out it was a crap-o-phone, saying "She had no idea that it was a fake" and promptly refunded our money. My enthusiasm for getting a real gramophone had not wavered so when I received a phone call from Bob Nix telling me he had a nice machine for sale and was happy to loan it to me to try out, I readily accepted. My wife and I attended the Canadian Antique Phonograph Society's November 2004 meeting which was really terrific because many of the members brought their beloved gramophones in for a special "show and tell" session. We saw lots of different models and makes which was very informative and educational. Of course CAPS President, Bob Nix was there to greet us once again and he presented us with an authentic Victorla VV-IV Model. This is a lidless, internal horn gramophone. Apparently the "Edwardians" found the external horn gramophones to be clumsy and bulky, taking up too much space in the parlor. The upper classes, which bought most machines, resented how dust collected on horns and complained that they were eyesores so the market responded with internal horn gramophones in variety of shapes and sizes. Bob told us that our machine was made in 1916 (serial numbers for this year ran 215000-290000 with an E suffix - some machines use "IV-" as model designation after mid year). In addition, Bob got us going with 50 needles that included both thin needles for soft tone and some thick needles for loud tone. The Victrola works great and we've already listened to my wife's Mother's favourite vintage 78s and we were both hooked on our new acquisition. I called Bob later in the week to let him know that we would purchase the machine and of course he was delighted. The IV was Victor's lowest priced model for many years. Production was started in September of 1911. Full production was discontinued in early 1924; however VV-IV's were still being assembled and shipped in low volumes as late as the spring of 1926. Catalogs state that the only available finish was oak, although several mahogany examples have apparently turned up in the hands of collectors; these were made near the end of the model run. Very early VV-IV's had a stamped steel grille covering the horn; subsequent versions had conventional wood slats in the horn opening. In 1917, the slats were again removed, revealing a hollow horn opening. Apparently, this was not a popular cost-cutting move, and the slats re-appeared the following year. Several design changes were made during production of this Victrola, as indicated by the change of suffix letter after the serial number. Most changes were of a very minor nature. The IV used a simple single-spring motor. The original 1911 selling price of the IV was $15.00. At the end of the model run, it sold new for $25.00. An estimated total of 608,000 Victrola IV's were produced. 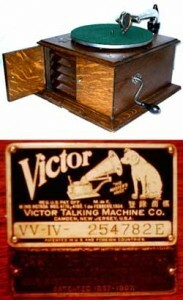 Mechanically, the Victrola is a device for converting recorded sound waves again into sound. The sound waves are recorded in a spiral groove on the face of the disc record. 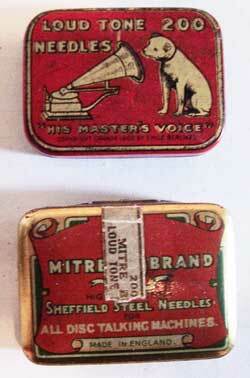 Reproduction, perfect in every detail, is made at will through the medium of the needle, the sound box and the amplifier. The needle traces the sound wave spiral on the rotating record, carrying the mica diaphragm of the sound box with it in sympathetic vibration. In turn, the diaphragm causes the air in the sound box to vibrate, inducing sound waves that are restored, to the quality and approximate volume of the original. A typical Victrola reproducing and amplifying mechanism, with the cabinet cut away is shown on Page 3. The spring motor beneath the turntable is wound with the winding key, either when the instrument is playing, or silent. On unwinding, the motor rotates the turntable at the turntable at the constant speed required for perfect reproduction. The whole mechanism has the simplicity of perfection. Each detail is the result of numberless experiments and tests, certified by satisfactory service in the hands of the public. Your Victrola should operate for years without trouble, providing the following simple instructions are followed, and in the event of trouble after extended service, your dealer will be able to replace the parts in the original perfect condition. The Victor steel needles are made with the utmost care, and each and every one is polished to a spherical point and fits perfectly in the Victor record grooves. For perfect reproduction and maximum record life it is recommended that you use none other than Victor steel needles. A new steel needle should be used for each record, as a steel point wears down during the playing.